We started using PRP early august 2009. A series of test candidates where treated. 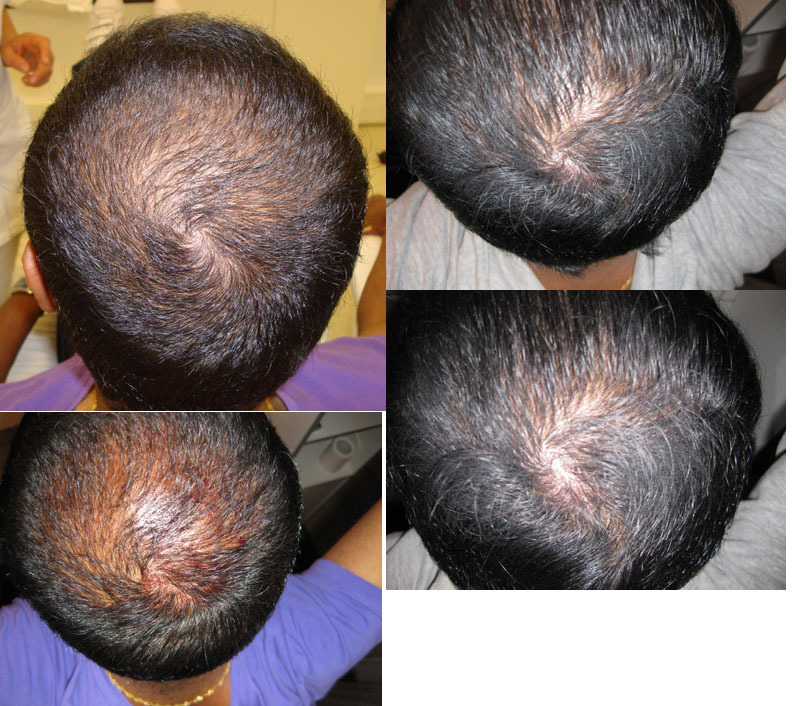 Today we have received the pictures of a patient on which we used prp to strengthen his crown area. Top right and top bottom : 2,5 months after PRP treatment. Please note that no topic or any other concealers where used. Although the pictures are not of best quality, it is quite clear that there is an effect visible. Also note that the pictures are taken using about the same angle. very good, for not bald people. » very good, for not bald people. That looks decent for diffuse thinners. I would try it if there were more before/after photos along those lines. Pfff, as I expected when reading the thread title. Different angles/lightning used in the before/after pics. YAY! » angles/lightning used in the before/after pics. YAY! results look good, subtle but definitely noticeable. I’d like to see more patients with similar outcomes. My hairloss is similar, receding at the front, thinning at the top/back, just slower than most guys I think. If PRP works its certainly worth it…but could get a bit costly with annual repeats. » strengthen his crown area. » Top right and top bottom : 2,5 months after PRP treatment. » visible. Also note that the pictures are taken using about the same angle. VERY VERY VERY important information is needed.Is this patient using any other hairloss treatments propecia or regaine? You didnt mention this fact bverotti at your initial post i think you know that is very important to know. He was on rogaine and propecia for a long time before he had PRP. He continued to use both after the treatment. » continued to use both after the treatment. » » continued to use both after the treatment. It would be nice to see a patient who is not on propecia or rogaine, for all we know it could be a periodic shed from the drugs in the before pics and now he is going back to baseline, i am not trying to say that this is not from PRP but it would be best if we saw a patient who is not on other drugs. Well, if only FDA approved works than you might think that the lasercomb is a proven solution. I think most of us know that lasercomb will have little effects if any at all. Yeah i saw that. Well there i couldnt see any difference at all. The guy didnt even look like he had hairloss before. But who knows maybe its doing something for these guys its just that i hear mixed things about this PRP, for example Dr.Feller decided to stop offering it because he didnt see any difference with it. On the other hand i havent seen one stand alone example that makes a worthmentioning difference…i ve seen 10 times better success stories with nizoral alone and it costs 7 dollars! by the way dont you know that the lazercomp is approved by the FDA for safety as a mechanical device. IS not approved for claiming that it will regrow hair. » stories with nizoral alone and it costs 7 dollars! Feller stopped offering it? I haven’t heard that. Do you have a link to where you saw this? Thanks. Bverroti, I looked at this ‘result’. I am not trying to have a pop at you and I appreciate the honest video, however, in my opinion if that is one of the better results then it is clearly not worth doing. The improvement - if any - is very small, it actually looks like the hair is just parted in a different way and combed over to try and look better to be honest. » where you saw this? Thanks.